On a sunny afternoon in the Siraha District of Nepal, a group of young men gathered on the edge of their community to play a card game as they kept an eye on their children playing nearby. The scene was nothing unusual until the group’s leader started to lead the men in a discussion about menstruation, ovulation, and cervical secretions. They were playing the Menstrual Cycle Game. Though the game was new to them, it has been played countless times in countries around the world. IRH first used the Menstrual Cycle Game with indigenous communities in the Department of Chuquisaca in Bolivia while conducting a USAID-funded fertility awareness project with Path and Universidad de Sucre. “[The participants] were very knowledgeable about anatomy, but didn’t quite understand the physiology and mechanism of the menstrual cycle,” said Jeannette Cachan, IRH’s Director of Capacity Building, and one of the game developers. The solution was the Menstrual Cycle Game. The basic methodology of the game has remained the same since its creation, though additional elements — such as connections with gender, social norms around menstruation, and menstrual management — have been added over the years as the game spread from country to country. A Pragati “male champion” leads a group in the Menstrual Cycle Game in the Siraha District of Nepal in March 2018. In the game, participants stand in a circle, representing the menstrual cycle. Thirty numbered cards representing each day of the menstrual cycle are either affixed to their chests or placed on the ground in numerical order. Additional cards represent the events of the menstrual cycle: ovulation, cervical secretions, and menstruation. Cards representing the ovum and assist in the discussion of male and female fertility. The group learns about the menstrual cycle as facilitators inquire what participants know about menstruation and fertility and layer on essential, actionable information. Key messages are shared, misconceptions that surface are dispelled, and concerns and questions germane to the context are addressed. For example, the facilitator may ask “How many days do women bleed?” and then confirm that every woman is different and it is normal that the number of bleeding days vary, but typically last anywhere from three to seven days. [LEFT] Participants play the Menstrual Cycle Game during a community education session in Tarabuco, Bolivia in 1996. Photo credit: Jeannette Cachan, IRH. 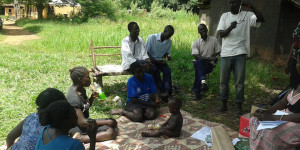 [RIGHT] A facilitator leads the game during prototype testing for the FACT Project in Gulu, Uganda in 2014. Photo credit: Dickens Ojamuge, Save the Children. During orientation, trainers emphasize that facilitators are not expected to be experts. If off-topic questions arise in the game, facilitators are trained to feel comfortable deferring the answer for a future session or inviting a health provider to respond. This simplicity means that a wide variety of groups can facilitate the Menstrual Cycle Game. Facilitators ranging from illiterate volunteers to literate educators, school teachers, Girl Scout leaders, and Peace Corps volunteers have successfully integrated the game into their work. Lillian Ojanduru, Research Coordinator for the FACT Project in Uganda, explains the Menstrual Cycle Game during prototype testing in 2014. Another valuable aspect of the game is its relative low cost. “At times, the local programs didn’t have professional materials,” said Cachan, “so facilitators wrote the numbers on scrap paper to create the cards themselves.” Local organizations in different contexts have adapted the visuals of the game, using stones or balloons instead of cards. IRH has facilitated adaptation of the game in several contexts, ensuring that specific misconceptions or concerns are addressed in the game. The game can also be tailored to meet the needs of the group, from very young adolescents to married adults.For example, with younger adolescents it can focus more on puberty and managing menstruation, while with married adults the focus is on fertility and family planning. View the Menstrual Cycle Game instructions developed for the Pragati project. Stay tuned for the full suite of FACT Project solution materials, including adaptations of the Menstrual Cycle Game! 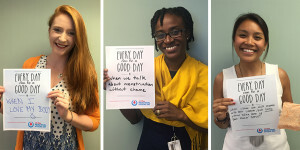 This Menstrual Hygiene Day, the Institute for Reproductive Health is joining with organizations around the world to proclaim that menstruation matters to everyone, everywhere!